Georgetown sailors pose for a photo after the Gill Coed National Championships held in San Diego. 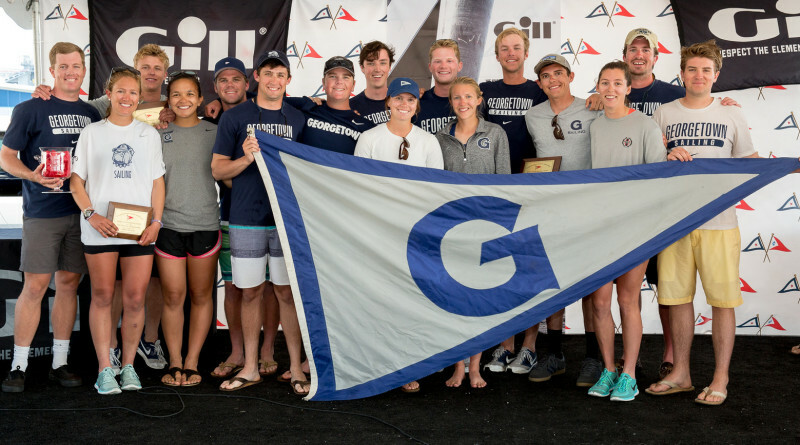 SAN DIEGO – After four days of intense competition Georgetown University won the national title and the Henry A. Morss Memorial Trophy at the Gill Coed National Championship co-hosted by San Diego Yacht Club and the Pacific Coast Collegiate Sailing Conference. It was a tough regatta both for the difficult weather conditions and the intense competition. The top five teams did a lot of swapping places on the scoreboard and it was tight racing up until the last race of the day on June 4. Georgetown took home the win only 5 points ahead of second place overall and won the Henry A. Morss Memorial Trophy, which was donated by a group of nationally known yachtsmen as a memorial to Henry A. Morss, a Boston yachtsman and 1907 Bermuda Race winner, as well as an MIT alumnus and benefactor. Final Overall Results: 1st: Georgetown University, 257; 2nd: U.S. Coast Guard Academy, 262; 3rd: Yale University, 266.